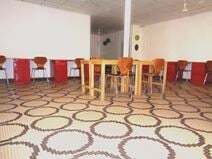 These private offices and co-working space is in the Wemtenga neighbourhood, a hub of international NGOs and mining companies, and very close to the diplomatic quarter (Koulouba). The co-working area is made up of 11 workstations while the private offices range from 11m² to 16m². Lush gardens are ideal for relaxing and invigorating breaks from your work. The transport links in the area are also excellent, with the centre being easily accessible by car, including on-site parking and benefiting from being in close proximity to Service Météorologie ASECNA airport.